This fragment is thought to have come from a pair of episcopal stockings, soft knee length type of boots usually worn by bishops, found in a tomb believed to be that of Walter de Cantelupe, Bishop of Worcester. 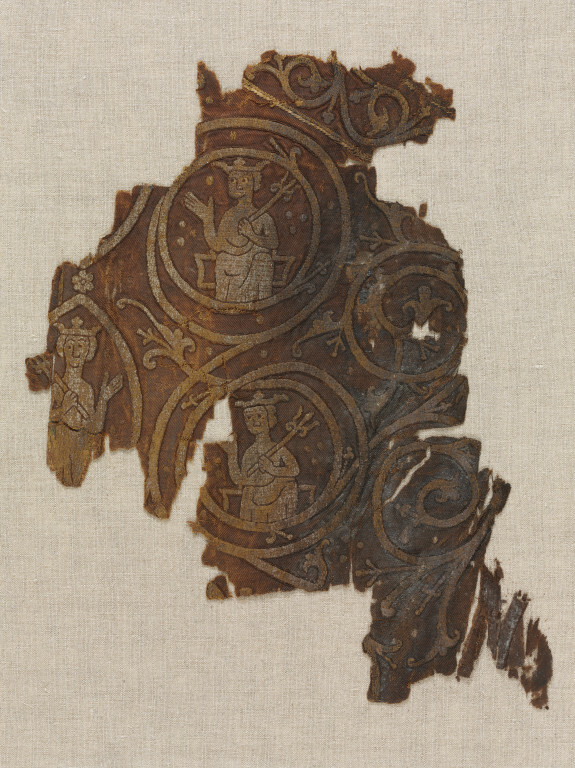 Other fragments are in the British Museum and Worcester Cathedral. Although embroidered in the 13th century, characteristic elements of 12th century, Romanesque art are present in the scroll work, with stiffly drawn figures, arranged in a formal geometric pattern. Records of the period, such as the 1295 Inventory of St Paul's Cathedral, London contain references to similarly decorated vestments. The fine silver-gilt thread is laid in vertical lines and it is worked in underside couching in a regular brick pattern, the latter typical of opus anglicanum (Latin for English work) of the early medieval period. Underside couching is a labour-intensive technique whereby the thread used to couch down the lines of silver-gilt thread is pulled through to the back of the material. It was used principally but not exclusively in English medieval embroidery. From about the mid 13th to the mid 14th century opus anglicanum was famed throughout Europe and bought by kings and popes. The silk twill material on which the embroidery was worked was imported, probably from Italy or even the Near East. 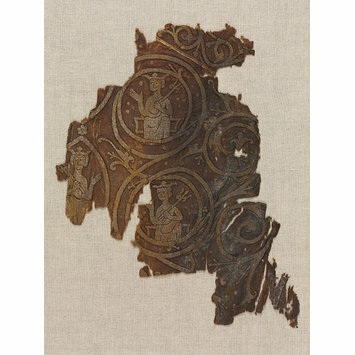 Browne, Clare; Davies, Glyn; Michael, M.A, English Medieval Embroidery: Opus Anglicanum , exhibition catalogue, London, Victoria and Albert Museum (London: 2016), pp.128-130.